Mom and dad (Kelli and Jonathan) are Morricia and Gomez. Oldest son Dominic is Lurch. Middle son Donovan is Uncle Fester. Daughter Mia is Wednesday. Youngest child Jon Boy is Pugsley. And Tyson is Cousin Itt. 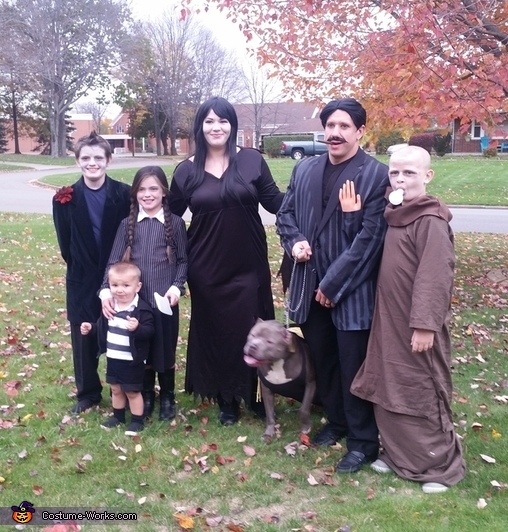 We wanted to incorporate the whole family and with this many peoplr its tough... we happened to be watching tv and The Addams Family movie was on. Perfect! Mom made most everything you see from thrift store items. Mom painted the stripes on Gomez's suit jacket and Pugsley's shirt. The hand (Thing!) And Fester's light bulb were bought online. The kids helped with Cousin Itt's costume... all items from the Dollar Tree. This was so much fun, and total cost was under $50. Happy Halloween everyone!